In 2014 I was introduced to Renee Phillips via mutual friends in New York. From the moment I stepped into her Chelsea studio in New York, I felt a connection. I was drawn to her colorful abstract paintings: their texture, positivity, warmth, the cohesive and creative flow. Over the four years since we met, I have been able to exhibit and sell works to various clients on both coasts and hoped for an opportunity to do a unique project with her. As I began planning my 2018 West Coast exhibition schedule, I approached Renee to collaborate on a special project in Los Angeles. Luckily for me, she said YES! The result is the new series 'The Shape of Color' created specifically for a new exhibition in West Hollywood launching April 1st. I sat down with Renee to discuss her newest series and to discover what she's planning this year. I hope you'll take a few minutes to read and follow this rising artist! 1. Your process seems to be a grounding force of your art making practice, can you tell me more about how the pieces from 'The Shape of Color' came to be? For the past 5 years I have been studying the science of color in the art studio - it has been a bit like a colorful science lab. I first examine each color in ‘studies’, determining viscosity in relation to time, temperature and humidity. Every color reacts differently, and has a particular dry time - some colors dry in 6 hours, others can take up to 20 hours. I basically sit in the studio and watch paint dry for hours on end, making notes on how each color reacts. 2. Wow, that’s dedication. Most people wouldn’t have the patience for that. So once you determine the color palette, what comes next? I then manipulate the paint with the natural elements of wind, water, heat and gravity. These practices create the foundation for how I achieve the textural moments - the drips, ripples, cracks and fissures you see on each piece. 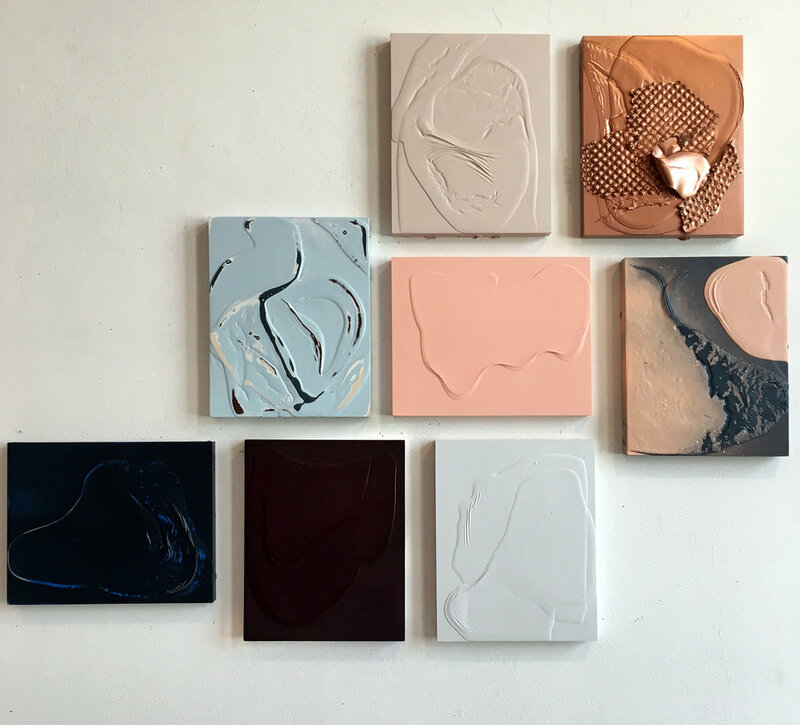 The creation of larger work also requires a physical element – I use the movement of my entire body when pouring and maneuvering the thick enamel paint on the surface. This dance helps guide each piece and I believe there is a subconscious undercurrent of feminine energy in that movement. 3. I understand that you began creating this series during pregnancy. Can you tell us more about that time? Prior to this series, I was working on a series of artwork called Controlled Chaos. That series really tapped into the frenetic energy of New York City and I was often able to translate this energy onto canvas – it was a high frequency point in my life prior to becoming pregnant. When I became pregnant with my first child, my perspective shifted; I began to view the world through a new lens. I had a strong desire to find stillness in my art, and daily life – to tone down the noise and just focus on the basic visual elements of color, form and movement. When I began to be present with these basic elements, a whole new world opened to me. 4. Aside from personal experiences, I hear you talk a lot about travel and meditationve walks as inspiration; can you tell us a bit about that? I’m a big believer in walking meditation. I live and work in Chelsea, so in the morning I’ll walk to the Hudson River and just be present, taking in the surrounding environment…the changing tide, the life cycle of the trees, a blooming flower, the decaying wood and eroding metal. Maybe I’ll take some photos or journal some thoughts. Through movement, my mind opens up to new ideas and inspiration. I’ll then go to the art studio with fresh concepts and start working with color and form. 5. And where have your latest travels taken you? Every summer I plan an inspirational road trip. The past two years I’ve ventured into the National Parks – Zion and Yellowstone were incredibly powerful in terms of inspiring new work. The study of how the elements of wind, water, fire and gravity affect change on Earth’s surface is greatly inspiring. 6. You can really see those elements at play in your work. The movement and color in this series tends to stir very visceral associations in the viewer... Was this new series inspired by somewhere specific? This series is grounded specific color selections, and my studies on the psychology of color. Color is such a powerful driver of memory, and I want viewers to have a visceral reaction to each piece. react to this series without their intellect getting in the way. What that reaction is, will be specific to that person’s personal experience, memories and view of the world. For me, this series recalls a full sensory experience from my childhood in the tropics – palm trees rustling in the wind, blooming bougainvillea, fluffy cumulus clouds, light reflecting off of the sea. With that said, I do hope the bold blocks of color and form create a unique experience for each viewer to call upon their own subconscious memories and positive associations. 7. Have you decided on where your 2018 inspiration trip will take you? I have, and it is to the islands of Greece! I’m looking forward to visiting a very dear artist friend of mine and settling into Greek island life for a bit. I don’t have any expectations or pre-conceived notions of Greece so I’m looking forward to seeing how my mind, body and spirit react to the location. I’m also very excited to explore Palm Springs and Joshua Tree National Park this Spring – a trip to the desert always clears my head and allows inspiration to flow freely.